Chances are you've spotted Rebecca Vallance's precision-cut designs on stylish women like Karlie Kloss, Rachel McAdams and Halle Berry as they walk the red carpet. 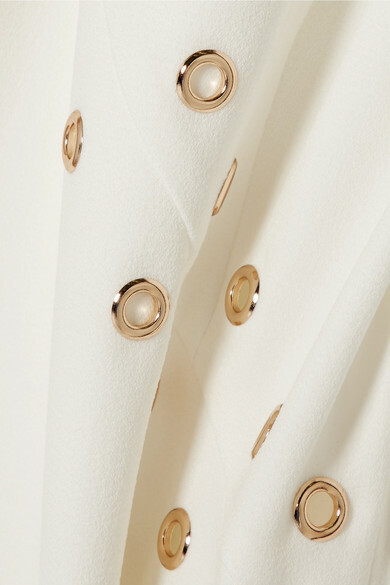 This 'Adriatic' midi dress is cut from optic white crepe for a figure-skimming fit and accented with asymmetric gold eyelets. It has a flattering V-neckline and split hem that show just the right amount of skin. Try yours with strappy heels and gilded accessories. Shown here with: The Row Shoulder bag, Gianvito Rossi Sandals, Kenneth Jay Lane Earrings.